San Gabriel Valley Tribune, the Pasadena Star, and the Whitter Daily News! A transcript of the article appears below. You may think cover bands have it easy they play other artists' hits and usually can land paying gigs, but in order to survive they must have musicianship and a have a large repertoire. 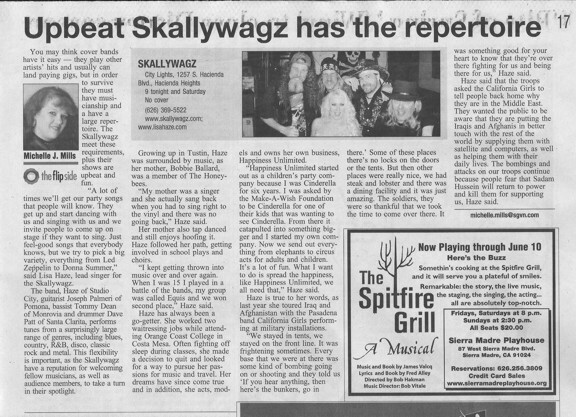 The Skallywagz meet these requirements, plus their shows are upbeat and fun. A lot of times we'll get our party songs that people will know. They get up and start dancing with us and singing with us and we invite people to come up on stage if they want to sing. Just feel-good songs that everybody knows, but we try to pick a big variety, everything from Led Zeppelin to Donna Summer, said Lisa Haze, lead singer for the Skallywagz. The band, Haze of Studio City, guitarist Joseph Palmieri of Pomona, bassist Tommy Dean of Monrovia and drummer Dave Patt of Santa Clarita, performs tunes from a surprisingly large range of genres, including blues, country, R&B, disco, classic rock and metal. This flexibility is important, as the Skallywagz have a reputation for welcoming fellow musicians, as well as audience members, to take a turn in their spotlight. Growing up in Tustin, Haze was surrounded by music, as her mother, Bobbie Ballard, was a member of The Honeybees. My mother was a singer and she actually sang back when you had to sing right to the vinyl and there was no going back, Haze said. Her mother also tap danced and still enjoys hoofing it. Haze followed her path, getting involved in school plays and choirs. I kept getting thrown into music over and over again. When I was 15 I played in a battle of the bands, my group was called Equis and we won second place, Haze said. Haze has always been a go-getter. She worked two waitressing jobs while attending Orange Coast College in Costa Mesa. Often fighting off sleep during classes, she made a decision to quit and looked for a way to pursue her passions for music and travel. Her dreams have since come true and in addition, she acts, models and owns her own business, Happiness Unlimited. Happiness Unlimited started out as a children's party company because I was Cinderella for six years. I was asked by the Make-A-Wish Foundation to be Cinderella for one of their kids that was wanting to see Cinderella. From there it catapulted into something bigger and I started my own company. Now we send out everything from elephants to circus acts for adults and children. It's a lot of fun. What I want to do is spread the happiness, like Happiness Unlimited, we all need that, Haze said. Haze is true to her words, as last year she toured Iraq and Afghanistan with the Pasadena band California Girls performing at military installations. We stayed in tents, we stayed on the front line. It was frightening sometimes. Every base that we were at there was some kind of bombing going on or shooting and they told us If you hear anything, then here's the bunkers, go in there.' Some of these places there's no locks on the doors or the tents. But then other places were really nice, we had steak and lobster and there was a dining facility and it was just amazing. The soldiers, they were so thankful that we took the time to come over there. It was something good for your heart to know that they're over there fighting for us and being there for us, Haze said. Haze said that the troops asked the California Girls to tell people back home why they are in the Middle East. They wanted the public to be aware that they are putting the Iraqis and Afghanis in better touch with the rest of the world by supplying them with satellite and computers, as well as helping them with their daily lives. The bombings and attacks on our troops continue because people fear that Sadam Hussein will return to power and kill them for supporting us, Haze said.